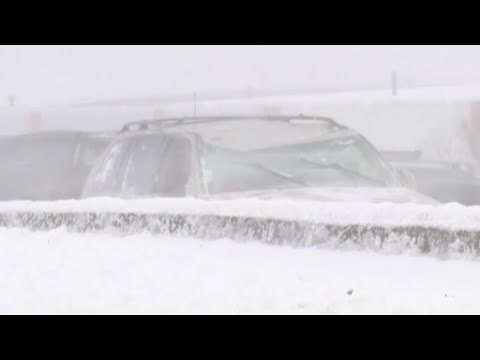 MINNEAPOLIS (AP) — Dangerous cold once again gripped the Upper Midwest on Monday, following a deadly blizzard that caused multiple pileups, paralyzed highways, and stranded motorists and anglers. A wind child advisory remains in effect for eastern North Dakota and most of the northern half of Minnesota until early Tuesday. The combination of low temperatures and strong wind made it feel like the minus 40s in northern North Dakota and northern Minnesota early Monday. Cold is expected to linger across the Upper Midwest for the first couple weeks of March, with subzero lows the first week of March, said Twin Cities National Weather Service meteorologist Caleb Grunzke. Dozens of schools in the four states closed Monday or began classes late due to the snow and bitter cold. Several highways in southern Minnesota remained closed or blocked early Monday after the storm that dumped about a foot (30 centimeters) of snow in some places. Transportation officials reopened Interstate 29 in northeastern North Dakota late Sunday but warned travelers about poor driving conditions. The Minnesota National Guard and sheriff’s deputies rescued nearly 100 stranded motorists over the weekend. The State Patrol said whiteout conditions Sunday contributed to 165 crashes with 20 injuries, according to the Minneapolis Star Tribune. In Wisconsin, a chain-reaction pileup Sunday involving 131 vehicles on Interstate 41 in the Neenah area killed one motorist and injured 71 others. Winnebago County Sheriff John Matz on Monday identified 30-year-old Andrew Schefelker of Oshkosh as the person killed in the pileup. Schefelker was a middle school/high school science teacher in the Iola-Scandinavia School District, Matz said. No travel was advised in parts of Wisconsin early Monday because of poor road conditions. A jail in St. James, Minnesota, temporarily housed the St. Cloud State men’s hockey team Sunday after its bus got stuck between two snowdrifts on a rural road. In northern Minnesota, rescuers on snowmobiles and snowshoes battled 50-mph (80 kph) winds to rescue four anglers stranded on a snow-swept lake. The anglers’ snowmobiles became stuck more than 2 miles (3.2 kilometers) out on Greenwood Lake Sunday afternoon, Cook County Sheriff Pat Eliasen told the Minneapolis Star Tribune. They were able to call police in Ontario, Canada, who alerted Cook County authorities. Search and rescue personnel from several agencies found the foursome about three hours later. One angler was showing signs of hypothermia, frostbite and dehydration and was taken to a hospital on roads that had to be cleared of drifting snow by a private plow operator. The roof of a 150-year-old historic covered bridge in Zumbrota in southeastern Minnesota collapsed Sunday due to the heavy snow and high winds, Minnesota Public Radio reported. It was the only remaining covered timber truss bridge in Minnesota, according to the state Transportation Department. Mayor Bradley Drenckhahn said the bridge, which is listed on the National Register of Historic Places, is insured and officials have the blueprint to rebuild it. In northeastern South Dakota, a grain train derailed in Milbank early Monday when it struck a pickup truck hauling a trailer that became stuck in snow at a crossing, City Administrator John Forman said. Twenty-three rail cars and two engines went off the track, spilling an unknown amount of grain. No one was hurt.